Your data center provider is more likely than ever to have a southern drawl or Midwestern lilt. The Southeast, Southwest, and Midwest are among the fastest growing data center markets in the United States, according to year end 2016 data from Synergy Research Group. This illustrates how data center market growth has gone far beyond its traditional strongholds of Washington, DC, New York and Silicon Valley. That lesson from Synergy’s latest report is déjà vu all over again, as former major league catcher Yogi Berra once said. There’s much more to the United States than just the metro areas along the two coasts, as we all learned after the November election. 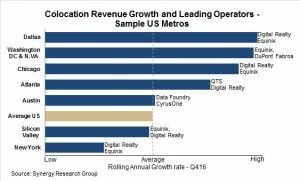 In all, the top ten U.S. metro areas accounted for 74% of retail and wholesale colocation revenue in 2016, according to Synergy. Dallas is right behind Washington, D.C. as the highest-growth metro region for data centers. Chicago, Atlanta and Austin also all outpaced the national average in 2016. The one market that cooled off was Silicon Valley. “There has been a dilution of new growth because there are other options,” said Sean Iraca, vice president for service enablement at Digital Realty Trust, the largest provider in five of the top 10 markets in the country. A lack of data center market growth in some medium and small metro areas hasn’t been for lack of demand, said Bryan Loewen, executive managing director at real estate firm Newmark Grubb Knight Frank’s data center practice. Instead, the major suppliers of the money needed for large data center build-outs are more reticent to back a project in smaller markets. Demand still exceeds supply in four of the top five markets – Washington, D.C., Chicago, Silicon Valley, Dallas, but not New York – so those spots are all safe bet for investors. That is yet another reminder: decisions about technology investments often are made not by technologists, but the companies that hold the purse strings big enough to fund a data center build. Metro areas such as Silicon Valley and Washington, D.C. saw data center construction five years ago because enterprises wanted private access to physical cross connects to achieve low-latency, low-bandwidth cloud computing, Iraca said. In recent years, all of the hyperscale and cloud computing companies have introduced and expanded private access and added availability, which has shifted some of that demand to other markets. Although hyperscale companies still represent the largest source of demand for colos in 2016, everyday organization shouldn’t fear that they’ll be squeezed out of colo spaces. More mature data center markets mean less pricing volatility, and colocation data center buyers are better educated and have a better understanding of what they are consuming than ever, Loewen said. “Consumers are not allowing data center operators to get outsized returns,” he said.